After re-examining its priorities, the Local School Board of Polomolok, which Mayor Matti chairs, approved its support for the training of teachers in reading. If their teachers teach reading well, the children’s learning performance will improve. Last July, Polomolok gathered its grade school teachers to attend a remedial reading workshop facilitated by Synergeia. The workshop was held at Our Lady of Mt. Matutum Trappistine Monastery, nestled at the foot of Mt. Matutum and a peaceful place that was conducive for learning. On the first day of the workshop, Synergeia CEO Dr. Nene Guevara taught phonemic awareness to the teachers. She emphasized that children do not learn reading by rote memorization but by knowing the sound of each letter and being able to blend them. She also taught the teachers how to develop comprehension among young learners. When Ma’am Nene read the story titled “The Little Red Hen,” the teachers produced sounds for the different characters in the story, making the storytelling activity fun and exciting. By making reading fun, children will develop love for reading. 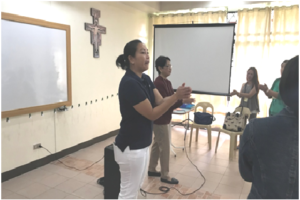 On the second day of the workshop, the teachers were assigned in two groups under Ma’am Nene and mentor Sunny Sevilla. After more practice exercises, the teachers were asked to come up with creative ideas and activities by which they can teach their students what they learned from the workshop. 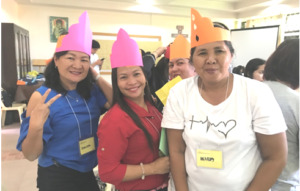 One can see the excitement of the teachers as they presented their ideas such as colorful crowns, word mobile, alphabet wheel, flip charts, storybooks and many more. One can feel their personal fulfilment with the new skills they have learned. Teachers enjoyed preparing creative instructional materials. And when it was time to leave, one can see from the smiles on the teachers’ faces that they are ready and eager to be better reading teachers to their students. The LGU and the teachers are prioritizing quality education for their children. This is indeed a happy beginning for Polomolok.